In addition to these macronutrients, prokaryotes require various metallic elements in small amounts. These are referred to as micronutrients or trace elements. For example, iron is necessary for the function of the cytochromes involved in electron-transport reactions. Some prokaryotes require other elementsâ€”such as boron (B), chromium (Cr), and manganese (Mn)â€”primarily as enzyme cofactors. Plants require only light, water and about 20 elements to support all their biochemical needs: these 20 elements are called essential nutrients. For an element to be regarded as essential, three criteria are required: 1) a plant cannot complete its life cycle without the element; 2) no other element can perform the function of the element; and 3) the element is directly involved in plant nutrition. The essential elements can be divided into two groups: macronutrients and micronutrients. Nutrients that plants require in larger amounts are called macronutrients. About half of the essential elements are considered macronutrients: carbon, hydrogen, oxygen, nitrogen, phosphorus, potassium, calcium, magnesium and sulfur. The first of these macronutrients, carbon (C), is required to form carbohydrates, proteins, nucleic acids, and many other compounds; it is therefore present in all macromolecules. On average, the dry weight (excluding water) of a cell is 50 percent carbon. As shown below,Â carbon is a key part of plant biomolecules. Three cellulose fibers and the chemical structure of cellulose is shown. Cellulose consists of unbranched chains of glucose subunits that form long, straight fibers. Cellulose, the main structural component of the plant cell wall, makes up over thirty percent of plant matter. It is the most abundant organic compound on earth. Plants are able to make their own cellulose, but need carbon from the air to do so. The next most abundant element in plant cells is nitrogen (N); it is part of proteins and nucleic acids. Nitrogen is also used in the synthesis of some vitamins. While thereÂ is an overwhelming amount of nitrogen in the air (79% of the atmosphere is nitrogen gas), the nitrogen in the air is not biologically available due to the triple bond between the nitrogen atoms. Only a few species of bacteria are capable of “fixing” nitrogen to make it bioavailable; thus nitrogen is often a limiting factor for plant growth. Phosphorus (P), another macromolecule, is necessary to synthesize nucleic acids and phospholipids. As part of ATP, phosphorus enables food energy to be converted into chemical energy through oxidative phosphorylation. Likewise, light energy is converted into chemical energy during photophosphorylation in photosynthesis, and into chemical energy to be extracted during respiration. Phosphorous is typically available in a form that is not readily taken up by plant roots; the form that is bioavailable is present in small quantities and rapidly “fixed” into the bioavailable form once again. Phosphorus is therefore often a limiting factor for plant growth. Potassium (K) is important because of its role in regulating stomatal opening and closing. As the openings for gas exchange, stomata help maintain a healthy water balance; a potassium ion pump supports this process. Potassium may be present at low concentrations in some types of soil, and it is the third most common limiting factor for plant growth. Other essential macronutrients: Hydrogen and oxygen are macronutrients that are part of many organic compounds, and also form water. Oxygen is necessary for cellular respiration; plants use oxygen to store energy in the form of ATP.Â Sulfur is part of certain amino acids, such as cysteine and methionine, and is present in several coenzymes. Sulfur also plays a role in photosynthesis as part of the electron transport chain, where hydrogen gradients play a key role in the conversion of light energy into ATP. Magnesium (Mg) and calcium (Ca) are also important macronutrients. The role of calcium is twofold: to regulate nutrient transport, and to support many enzyme functions. Magnesium is important to the photosynthetic process. These minerals, along with the micronutrients, which are described below, also contribute to the plantâ€™s ionic balance. In addition to macronutrients, organisms require various elements in small amounts. These micronutrients, or trace elements, are present in very small quantities. They include boron (B), chlorine (Cl), manganese (Mn), iron (Fe), zinc (Zn), copper (Cu), molybdenum (Mo), nickel (Ni), silicon (Si), and sodium (Na). Deficiencies in any of these nutrients, particularly the macronutrients, can adversely affect plant growth. Depending on the specific nutrient, a lack can cause stunted growth, slow growth, or chlorosis (yellowing of the leaves). Extreme deficiencies may result in leaves showing signs of cell death. Plants may also benefit from microbial partners in nutrient acquisition. Particular species of bacteria and fungi have co-evolved along with certain plants to create a mutualistic symbiotic relationship with roots. This improves the nutrition of both the plant and the microbe. The formation of nodules in legume plants and mycorrhization can be considered among the nutritional adaptations of plants. However, these are not the only type of adaptations that we may find; many plants have other adaptations that allow them to thrive under specific conditions. A parasitic plant depends on its host for survival. Some parasitic plants have no leaves. An example of this is the dodder, which has a weak, cylindrical stem that coils around the host and forms suckers. From these suckers, cells invade the host stem and grow to connect with the vascular bundles of the host. The parasitic plant obtains water and nutrients through these connections. The plant is a total parasite (a holoparasite) because it is completely dependent on its host. Other parasitic plants (hemiparasites) are fully photosynthetic and only use the host for water and minerals. There are about 4,100 species of parasitic plants. A saprophyte is a plant that does not have chlorophyll and gets its food from dead matter, similar to bacteria and fungi (note that fungi are often called saprophytes, which is incorrect, because fungi are not plants). Plants like these use enzymes to convert organic food materials into simpler forms from which they can absorb nutrients. Most saprophytes do not directly digest dead matter: instead, they parasitize fungi that digest dead matter, or are mycorrhizal, ultimately obtaining photosynthate from a fungus that derived photosynthate from its host. Saprophytic plants are uncommon; only a few species are described. A symbiont is a plant in a symbiotic relationship, with special adaptations such as mycorrhizae or nodule formation. Fungi also form symbiotic associations with cyanobacteria and green algae (called lichens). Lichens can sometimes be seen as colorful growths on the surface of rocks and trees. The algal partner (phycobiont) makes food autotrophically, some of which it shares with the fungus; the fungal partner (mycobiont) absorbs water and minerals from the environment, which are made available to the green alga. If one partner was separated from the other, they would both die. An epiphyte is a plant that grows on other plants, but is not dependent upon the other plant for nutrition. Epiphytes have two types of roots: clinging aerial roots, which absorb nutrients from humus that accumulates in the crevices of trees; and aerial roots, which absorb moisture from the atmosphere. An insectivorous plant has specialized leaves to attract and digest insects. 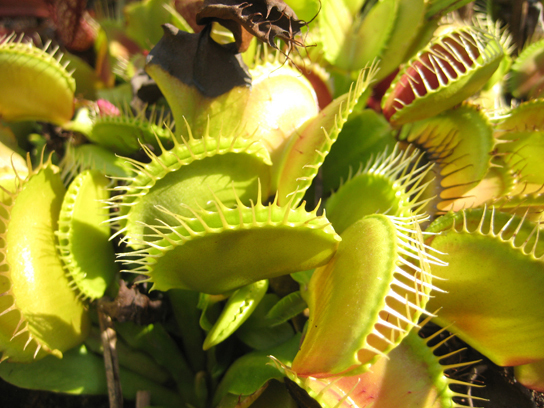 The Venus flytrap is popularly known for its insectivorous mode of nutrition, and has leaves that work as traps. The minerals it obtains from prey compensate for those lacking in the boggy (low pH) soil of its native North Carolina coastal plains. There are three sensitive hairs in the center of each half of each leaf. The edges of each leaf are covered with long spines. Nectar secreted by the plant attracts flies to the leaf. When a fly touches the sensory hairs, the leaf immediately closes. Next, fluids and enzymes break down the prey and minerals are absorbed by the leaf. Since this plant is popular in the horticultural trade, it is threatened in its original habitat. Most animals obtain their nutrients by the consumption of other organisms. At the cellular level, the biological molecules necessary for animal function are amino acids, lipid molecules, nucleotides, and simple sugars. However, the food consumed consists of protein, fat, and complex carbohydrates. Animals must convert these macromolecules into the simple molecules required for maintaining cellular functions, such as assembling new molecules, cells, and tissues. The conversion of the food consumed to the nutrients required is a multi-step process involving digestion and absorption. During digestion, food particles are broken down to smaller components, and later, they are absorbed by the body. Herbivores are animals whose primary food source is plant-based. Examples of herbivores, as shown below, include vertebrates like deer, koalas, and some bird species, as well as invertebrates such as crickets and caterpillars. These animals have evolved digestive systems capable of handling large amounts of plant material. Herbivores can be further classified into frugivores (fruit-eaters), granivores (seed eaters), nectivores (nectar feeders), and folivores (leaf eaters). Carnivores are animals that eat other animals. The word carnivore is derived from Latin and literally means “meat eater.” Wild cats such as lions and tigers are examples of vertebrate carnivores, as are snakes and sharks, while invertebrate carnivores include sea stars, spiders, and ladybugs. Obligate carnivores are those that rely entirely on animal flesh to obtain their nutrients; examples of obligate carnivores are members of the cat family, such as lions and cheetahs. Facultative carnivores are those that also eat non-animal food in addition to animal food. Note that there is no clear line that differentiates facultative carnivores from omnivores; dogs would be considered facultative carnivores. Omnivores are animals that eat both plant- and animal-derived food. In Latin, omnivore means to eat everything. Humans, bears and chickens are example of vertebrate omnivores; invertebrate omnivores include cockroaches and crayfish. The omega-3 alpha-linolenic acid and the omega-6 linoleic acid are essential fatty acids needed to make some membrane phospholipids. Vitamins are another class of essential organic molecules that are required in small quantities for many enzymes to function and, for this reason, are considered to be co-enzymes. Absence or low levels of vitamins can have a dramatic effect on health, as outlined in the tables below. Both fat-soluble and water-soluble vitamins must be obtained from food. Minerals are inorganic essential nutrients that must be obtained from food. Among their many functions, minerals help in structure and regulation and are considered co-factors. Certain amino acids also must be procured from food and cannot be synthesized by the body. These amino acids are the â€œessentialâ€ amino acids. The human body can synthesize only 11 of the 20 required amino acids; the rest must be obtained from food in the form of protein. When eaten, proteins are broken down into their amino acid building blocks and are then used almost immediately to synthesize new proteins needed by the body. The essential amino acids are listed below (note, you are not required to memorize vitamins and minerals included in these tables). Written by: Shana Kerr on November 13, 2016. Last revised by: Emily WeigelMarch 23, 2018.